PlayerUnknown's Battlegrounds on-going battle against cheaters has seen 13 million accounts banned so far. That's not necessarily 13 million people, as some cheaters may have returned under different accounts. The 13 million bans that have been carried out since June 2017 are "due to the unauthorised use of illegal programs". The numbers have been crunched by Reddit user sjk045, who compiled 69 different posts from developer Bluehole (spotted by Eurogamer), which released weekly updates on the number of players banned. 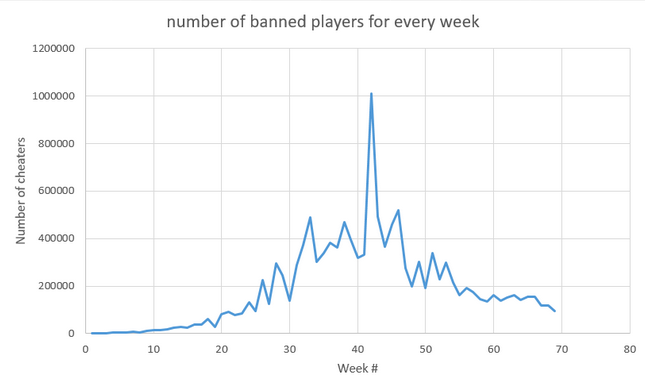 He even compiled a handy graph, which shows a serious spike in cheaters during one week in January - when more than one million players were banned. The number of bans have reduced in recent weeks (this past week, fewer than 100,000 bans were issued, the lowest since last year), although that may be due to the slight slowdown in PUBG users.